Shokri, B., Hosseini, S., Sharifian, M. (2008). Surface Modification of Silicone Rubber Membrane by Microwave Discharge to Improve Biocompatibility. Iranian Journal of Pharmaceutical Sciences, 4(1), 45-50. Babak Shokri; Seyyed Iman Hosseini; Mehdi Sharifian. "Surface Modification of Silicone Rubber Membrane by Microwave Discharge to Improve Biocompatibility". 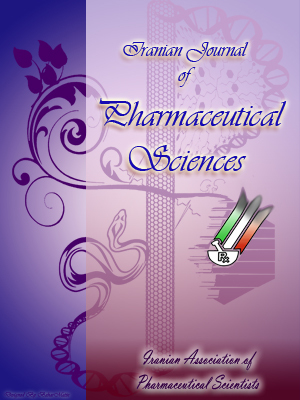 Iranian Journal of Pharmaceutical Sciences, 4, 1, 2008, 45-50. Shokri, B., Hosseini, S., Sharifian, M. (2008). 'Surface Modification of Silicone Rubber Membrane by Microwave Discharge to Improve Biocompatibility', Iranian Journal of Pharmaceutical Sciences, 4(1), pp. 45-50. Shokri, B., Hosseini, S., Sharifian, M. Surface Modification of Silicone Rubber Membrane by Microwave Discharge to Improve Biocompatibility. Iranian Journal of Pharmaceutical Sciences, 2008; 4(1): 45-50. Wetability of biocompatible polymers can be improved by plasma surface modification. The purpose of this study was to surface modify an experimental poly (dimethylsiloxane) rubber (PDMS) material in order to improve its wetability and biocompatibility. Surface properties of the PDMS were characterized using contact angles measurement for wetability analysis. Samples of experimental silicone rubber were surface modified by first argon, hydrogen, oxygen plasma treatment. In all cases, contact angles were measured. We have observed that oxygen, argon, and hydrogen glow discharges are quite effective in reducing the water contact angle of PDMS. However, indifferently to the efficiency of the treatment, practically all of the modified surfaces recovered great part of their original hydrophobicity. Surface modified materials had comparable contact angles to surfactant modified silicone rubber, all being significantly lower than the unmodified material. Oxygen microwave discharge treatment proved an effective way of improving the wetability and biocompatibility of an experimental silicone rubber without altering bulk properties. Non-thermal and low pressure plasmas have been used in a series of surface treatment applications. The majority of plasma assisted technologies are based on low pressure processes . The treatment of polymeric materials with plasma is a frequently used technique to accomplish surface modifications that affect chemical composition as well as surface topography. Moreover, microwave discharges are routinely employed in the processing of materials to deposit films as well as coatings [2-4]. In recent years, the modification of elastomer surfaces with plasma has also become an important tool in micro fluidics where elastomers such as poly (dimethylsiloxane) (PDMS) are used as substrates for micro-reactors . PDMS is a hydrophobic polymer for which exposure to oxygen plasma leads to oxidation and chain scission as well as cross-linking and the formation of a silica-like surface . Additionally, oxygen plasma is utilized to adhere the polymer permanently to other silicon-based materials. The latter method is commonly employed to create sealed channels from open microstructure surfaces obtained by soft photolithography . Recent studies have also proposed reaction mechanisms for the functionalization of PDM surfaces using a variety of plasmas created from gases such as argon, oxygen and CO2 [8-10]. To investigate the complex reaction between the plasma and the polymer surface, it is important to understand the plasma parameters and their effect on the surface modification. In most of the reports, the plasma excitation source power (RF or Microwave) is compared with extent of surface modification, but in practice, it is not only the excitation power but also the pressure, degree of ionization and other plasma parameters that affect the polymer surface. Hence it is important to consider the effect of all the other plasma properties (microscopic plasma parameters, like ion energy, ion flux, degree of ionization etc.) to analyze the surface modification of polymers. In our current experimental observation, we used a microwave plasma source to modify the surface of silicone rubber samples. The microwave plasma has significant advantage over other techniques like Radio Frequency Glow Discharge (RFGD) frequently used in polymer surface modifications . Microwave sources can be operated at low pressures (10-3 to 10-1 mbar), which reduces the risk of gas phase contamination during processing. Moreover the plasma properties can be controlled conveniently by adjusting the microwave power. Hence surface modification of this polymer becomes important. In this paper we demonstrate the effect of microwave plasma on the surface property of PDMS with argon (inert), xenon (inert), hydrogen (reactive) and oxygen (reactive). Figure 1. The experimental plasma system for the plasma treatment of PDMS. Table 1. The data of the contact angle measurement immediately and after 24h. The plasma surface treatment was reached in microwave-induced plasma with surface wave at power level of 100 W. Experimental setup is shown in Figure 1. Microwave generator was coupled to the load via ferrite circulator. Then microwaves propagated through impedance tuning to surface wave launcher (Figure 1). As it can be seen, it is truly surfaguide. In order to get the high electric intensity we used two short metal tubes (20 cm in height and 5 cm in inter diameter) that were cooled by in/out water circulator. Experimental setup consists mainly of a surfaguide microwave (2.45 GHz, 0-300 W) generator (Sairem, GMP 03 KED), the glass vacuum chamber, rotary vane and diffusion pump, pressure Pirani gauge and needle valve. The microwave source is particularly suited for plasma applications (etching, sputtering, ion source, discharge, diamond deposition, surface treatment and etc.) and for any industrial, medical or scientific application requiring microwave energy. It has forward and reflected power detector that define the pure power on the loud (plasma discharge). In this experiment, we use the difference of forward and reflected power as a pure power is loaded on the plasma. To decrease the reflected power we use impedance matching (three stub tuners, indicated in Figure 1). Discharge proceeds in the homemade vacuum chamber of plasma reactor (a long Pyrex glass column 65 cm in height and 3.5 cm in internal diameter). The sample is dangled within the column at the plasma zone (within the short metal tubes) by plastic string and exposed to the plasma for surface treatment. During the treatment, the apparatus was continuously pumped by an 8 m3.h-1 oil rotary vane and diffusion pump. Before the plasma treatment, the basic pressure was pumped down to less than mtorr and then the carrier gas was introduced into the reactor chamber. The admission of the gases is controlled by needle valve while the chamber pressure is monitored by a Pirani gauge. It has been recommended prior to the treatments, commercially poly(dimethylsiloxane), (PDMS), coupons have to be cleaned in ultrasonic isopropyl alcohol baths for 10 min., sonicated in distilled water and then dried in a muffle at 80 °C for 60 min. After dangling the sample in the column (where plasma is formed), the reactor was pumped down to less than 10-3 mtorr to reduce the presence of atmospheric contamination. Subsequently, the pressure was adjusted (5×10-1mbar) and the plasma ignited (by high voltage igniter gun) for the predetermine pressure, power and time. Contact angles were estimated with a homemade optical system. A drop of liquid (10 μl) was placed on a specially prepared plate of substratum and the image was immediately sent via the digital camera (Canon, power shot pro 1, 8 mega pixcls, 7× optical zoom) to the computer for analysis and contact angle estimation. Figure 2. Contact angle of silicone as-received and immediately after exposed for 30 s to hydrogen, oxygen, argon and xenon plasma at 100 and 5×10-1 mbar of applied power and chamber pressure, respectively. Figure 3. Schematic representation of the possible mechanism responsible for the hydrophobic recovery in microwave plasma treated polymers. Figure 2 depicts the water contact angles of PDMS samples as received and 10 min. after exposure for 30 s to hydrogen, oxygen, argon and xenon plasmas at 100 W. As one can observe, all four treatments caused θ to decrease. Furthermore, another very interesting detail shown in Figure 2 is that hydrogen plasma is extremely efficient in increasing the hydrophilicity of the silicone rubber. Other authors, Rangel et al. in different circumstances (RF plasma with oxygen, argon, hydrogen), also observed different effect. They conclude that oxygen plasma is extremely efficient in increasing the hydrophilicity of the silicone rubber. Table 1 contains the data of the contact angle measurement immediately and after 24 h. It shows that effect is transitory and there are at least two explanations for it [13-16]. Yasuda et al. for instance, attribute it to the rotation of polar groups around the polymeric backbone into the polymer bulk. Other authors  affirm that contamination or nonspecific surface degradation effects cause such recovering. In this case such as Rangel et al. we believe that the first mechanism, namely the rotation of surface polar groups, is the main responsible for the observed tendency to recuperate the original hydrophobicity. Figure 3 depicts the situation where the rotation of polar groups would take place. Inelastic collisions, mainly involving species on the polymer surface and energetic electrons in the plasma, can result in chemical bonds breakage creating free radicals in the polymer. Reactions between atomic oxygen and free radicals may add peroxides (O2- radicals) to the surface, as shown in the Figure 3 . The exposure of silicone surface to different microwave plasmas (hydrogen, oxygen, argon and xenon) resulted in the increase of its biocompatibility, but hydrogen plasma has the best result. However, in any circumstances the surface tended to recover its original hydrophobicity. Kogelschatz U. Dielectric-barrier discharges: Their history, discharge physics, and industrial applications. Plasma Chem Plasma P 2003; 23: 1-46. Kuzmichev AI. Ion-plasma sources based on a microwave-oven. Instrum Exp Tech 1994; 37: 648-53. Asmussen V. Electron cyclotron resonance microwave discharges for etching and thin-film deposition. J Vac Sci Technol 1989; 7: 883-9. Takahashi C, Jin Y, Nishimura K, Matsuo S. Anisotropic etching of Si and WSiN using ECR plasma of SF6-CF4 gas mixture. Jpn J Appl Phys 2000; 39: 3672-6. McDonald JC, Whitesides GM. Poly(dimethyl-siloxane) as an aterial for fabricating microfluidic devices. Acc Chem Res 2002; 35: 491-9. Hillborg GM, Ankner JF, Gedde UW, Smith GD, Yasuda HK, Wikstrom K. Crosslinked polydi-methylsiloxane exposed to oxygen plasma studied by neutron reflectometry and other surface specific techniques. Polymer 2000; 41: 6851-5. Xia YN, Whitesides GM. Soft lithography. Annu Rev Mater Sci 1998; 28: 153-84. Kim H, Urban MW. Effect of discharge gases on microwave plasma reactions of imidazole on poly(dimethylsiloxane) surfaces: Quantitative ATR FT-IR spectroscopic analysis. Langmuir 1999; 15: 3499-505. Ginn, BT, Steinbock O. Polymer surface modification using microwave-oven-generated plasma. Langmuir 2003; 19: 8117-8. Nowak S, Groning P, Kuttel OM, Colland M, Diltler G. Electron-cyclotron resonance plasma-experiment for in-situ surface modification, deposition, and analysis. J Vac Sci Technol 1992; 10: 3419-25. Nnrgrzvnd A, Matlakowska R. Influence of exopolymers produced by bacterial cells on hydrophobicity of substrate surface. Biotechnol Tec 1997; 11: 837-40. Rangel EC, Gadioli GZ, Cruz NC. Investigations on the stability of plasma modified silicone surfaces. Plasmas Polym 2004; 9: 35-48. Everaert EPJM, van De Belt-Gritter B, van Der Mei HC, Busscher HJ, Verkerke GJ, Dijk F, Mahieu HF, Reitsma A. In vitro and in vivo microbial adhesion and growth on argon plasma-treated silicone rubber voice prostheses. J Mater Sci Mater Med 1998; 9: 147-57. Kim J, Chaudhury MK, Owen MJ, Orbeck T. The mechanisms of hydrophobic recovery of polydimethylsiloxane elastomers exposed to partial electrical discharges. J Colloid Interf Sci 2001; 244: 200-7. Hillborg H, Sandelin M, Gedde UW. Hydrophobic recovery of polydimethylsiloxane after exposure to partial discharges as a function of crosslink density. Polymer 2001; 42: 7349-62. Bar G, Delineau L, Hafele A, Whangbo MH. Investigation of the stiffness change in the indentation force and the hydrophobic recovery of plasma-oxidized polydimethylsiloxane surfaces by tapping mode atomic force microscopy. Polymer 2001; 42: 3627-32. Yasuda H, Yasuda T. The competitive ablation and polymerization (CAP) principle and the plasma sensitivity of elements in plasma polymerization and treatment. Polym J Sci Part A- Polym Chem 2000; 38: 943-53. Kuzuya M, Noguchi A, Tanaka Y, Sawada K, Yang DT, Yavagihara Y, Kamiya K. Physiochemical properties of a novel nitrogen-containing plasma-deposited ultra thin. J Chem Soc Faraday T 1990; 86: 2971-4.